You’ve probably heard of Amazon’s Kindle. It’s like a book, only it costs $399 — just like every other electronic gadget now on the market. Notice how everything costs $399? When I was a boy, everything cost $1.98. Except for DC comics, which, at the beginning of my Superman period, would fetch anywhere from 10 to 12 cents. I mocked the concept of an e-reader back in September, but now that Amazon has rolled out the Kindle, I’ve prepared a guide to help decide if there should be one under your Family Tree this Holiday Season. 1. Do you like to read more than one book at once? If so, you’ll want the Kindle, because it will store 200 of them. And they won’t be just any books, but selected titles from publishers that have inked a deal with Amazon, so freshness is guaranteed. Imagine that: carrying around a big bag full of books in a package about the size of a Stephen King novel, though hopefully not as heavy. Click a few buttons, accidentally shut it off and turn it back on, click a few more, curse a few times and presto! — You’re not reading The Secret anymore, but just starting on chapter three of the latest Nicholas Sparks novel (The Bottle to Remember). Let’s hope Nick’s people have straightened out the DRM issues by Monday. 2. Do you prefer that people not see what it is you’re reading? Me too, and that’s why the Kindle is such a breakthrough. You could have James Patterson for Dummies on there, and as far as anyone else knows, you’re reading War and Peace. It’ll be our little secret. 3. Have you ever accidentally left a book on the plane when you’re getting off? That nuisance will be a thing of the past, since you’d be crazy to leave a $399 piece of hardware stuffed in with the safety instructions where anybody could grab it. Thanks, Kindle! 4. 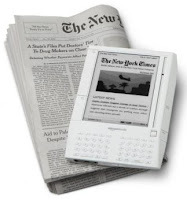 Will the Kindle interface with your TiVo? You know what they say: If you have to ask, the answer is no. But really, think about it: Why would Amazon or the publishing houses want their works readily viewable on Hi-Def televisions? Pretty soon, everybody would be reading their books on TV, which might then lead some to watch reruns of Dog the Bounty Hunter instead. 5. Is it important to save money on your book purchases? If so, you’ll want the Kindle, since electronic books might one day cost as much as 10 or 15 percent less than the paper versions. That’s a significant savings — not a whole lot less than the typical Border’s coupon you could find blowing down the street. Once you amortize the cost of the e-reader and the occasional books lost to synching problems and static electricity, it’s all gravy! I was ambivalent about picking up an e-book reader, but after weighing the benefits I’ve actually convinced myself. They don’t go on sale until Monday, but the line starts now. And right here. I am no likelier to leave a Kindle on a plane than I am to leave a camera in a bar in Marlborough, Massachusetts or an expensive pair of gloves on the 21 bus on Walnut Street in Philadelphia. But you left out another important reason to buy a Kindle for every member of your household. No band of toughs will ever rob you of your $399 electronic paperback and its accompanying copy of Persuasion or Sense and Sensibility. People just respect reading too much to do anything like that. Certainly in Philly they do. The reverence for reading in the City of Brotherly Love is well known. I expect Kindles to be all the rage on Allegheny Ave.
Don’t forget the throngs at Geno’s Steaks, clutching their Kindles and catching up on the classics while they wait in those inexplicably long lines. To hew to the spirit of the store’s injunction to order in English becuase you’re in America, they will be busy punching down their Moliere and Dante and punching up their Henry James.